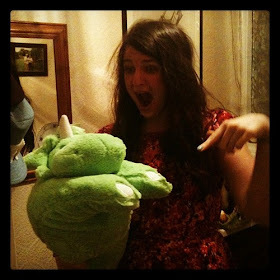 t*rexes and tiaras: Can some ghosts live upstairs? 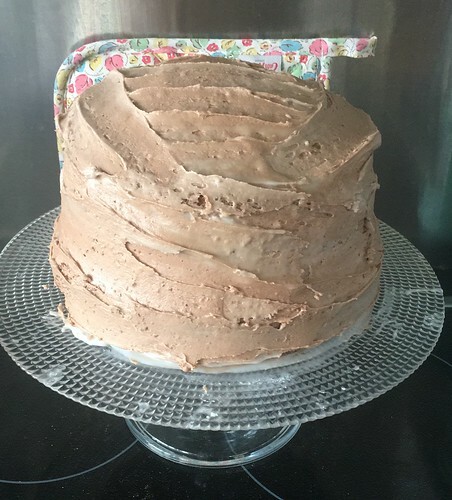 I love baking and I love a challenge, so of course when my sister asked me a few weeks ago whether I'd make her a birthday cake, I agreed and started racking my brains (and browsing Pintrest) to think of something she'd love. She's a big Studio Ghibli fan, recently introducing me to a couple of her favourites (we've seen The Red Turtle and she's also had me watch Spirited Away and My Neighbour Totoro recently too). 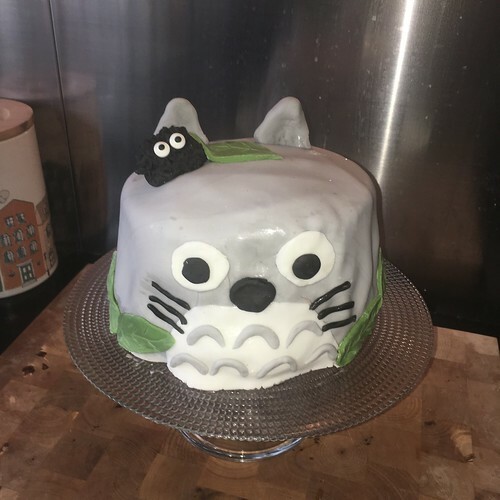 In fact, when I needed something to cheer her up a couple of weeks back, I set about making her some soot sprite cookies and I guess that inspired me to attempt a Totoro cake for her actual party. She's fairly easy to please when it comes to the actual cake part of things - a chocolate sponge always goes down well. 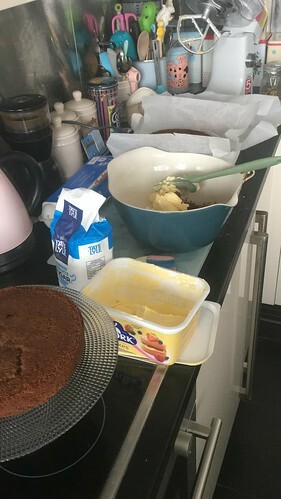 For this, I used my tried and tested usual sponge cake method: weigh your eggs, use the same weight of butter, sugar and plain flour. Add a splash of milk, 1.5tsp of baking powder and for chocolate sponge, a tablespoon of cocoa powder. I made three layers, using a slightly smaller tin for the top layer in the hope that they'd end up kind of dome shaped when I stacked them up. I sandwiched the layers with seedless strawberry jam (her favourite, bleugh) and whipped up some buttercream to smooth around the shape. 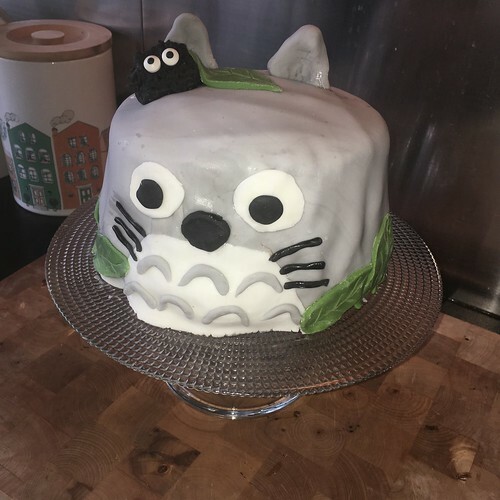 I'd hoped to mix up some fondant icing using fondant icing sugar but it didn't seem to want to thicken up enough, so in the end I dyed the majority of a block of shop-bought white fondant icing with a little bit of black food colour gel to give me a greyish colour. 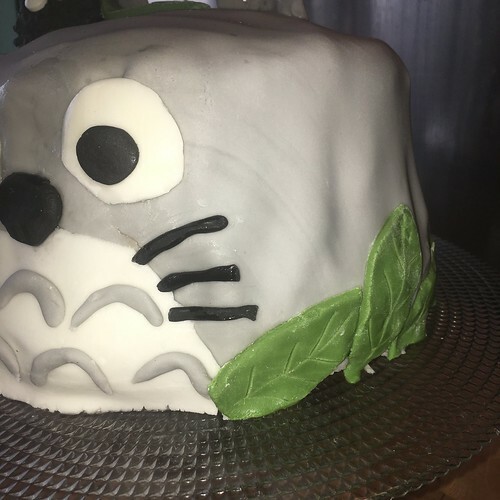 I modelled some primitive ears from the grey and held a little back for the marks on Totoro's tummy, before rolling the remainder out quite thin to cover the cake. I tend to make things like this up as I go along, and when I'm putting together a cake find it easier to place it onto it's stand first to work directly on there - too many occasions in the past where I've tried to move something once it was complete and had it fall apart. More primitive fondant icing shapes, all using shop-bought blocks (one green and one black, but I didn't use very much of either, and the remains of the white block I'd turned grey for the eyes and the tummy. I stuck the second layer on with just a little warm water, using a pastry brush to soften the layers up, and found that it worked perfectly well. I know that sometimes people seem to use thinned down jam for this part. 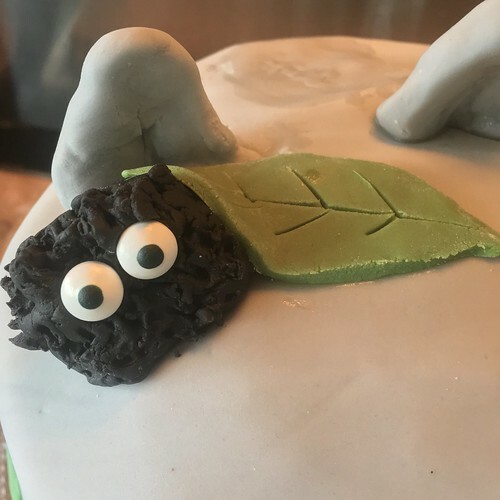 The only other thing I used was a pair of sugar eye (which I've previously bought from Hobbycraft but have noticed that our local Tesco has begun selling them) for the soot sprite. Everything else is just fodant icing and it all seemed to stay together well, even in transit. I must invest in some larger cake boxes. It seemed to be well-received and hopefully tasted good, too. I know it's a little primitive, but at least she knew what he was meant to be! It's so good. I've never watched it but it's on this week so am recording it and looking forward to becoming a fan. It wasn't primitive at all!! It was excellent!!! 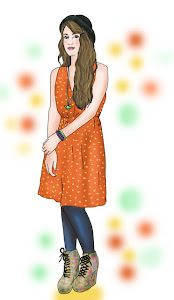 Awww, I love it, not primitive at all. Homemade birthday cakes are the best!